Greetings, Stampers! I have some 'sneak peeks' for you from the Stampin' Up Spring Catalog today. I think the new accessory I like the most so far is the Tea Lace Paper Doilies. They make every project you use them on so romantic and sweet. 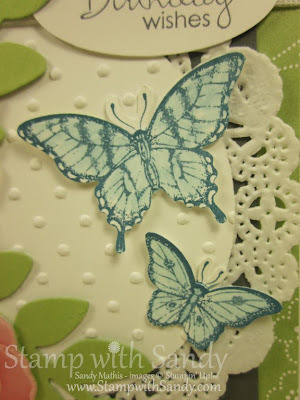 The flowers and leaves were made using the new Secret Garden Stamp Set and coordinating Secret Garden Framelits, and the smaller of the two butterflies was punched with the new Bitty Butterfly Punch. I'm playing along with two challenges today. The first is the Mojo Monday Sketch Challenge, which is once again perfect for using a doily in the background. The second challenge is the ColorQ Challenge. 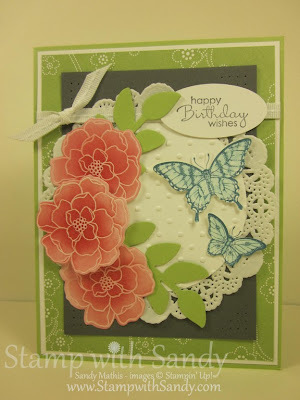 I love these colors together, but had to adjust a bit to use current Stampin' Up colors. I substituted Certainly Celery for Pear Pizzazz, and Island Indigo for Bermuda Bay. Aren't these flowers pretty? 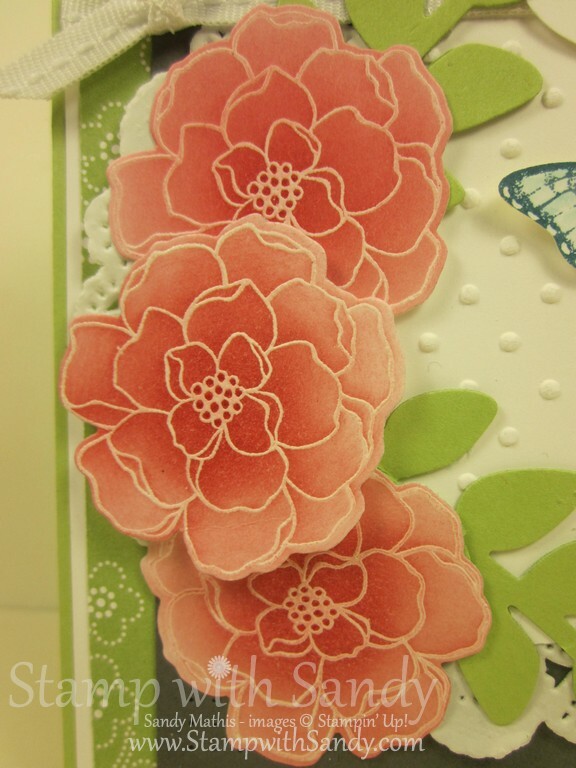 I used Whisper White Card Stock and heat embossed the images with White Embossing Powder. Then I used a Sponge Dauber to sponge on Real Red Ink, which takes on a more pinkish hue when it's sponged. Finally, I took a napkin to wipe off the ink from the white embossed areas and cut the shapes out with my Secret Garden Framelits. The butterflies, from the Papillion Potpourri Stamp Set, were stamped with Island Indigo Ink onto Whisper White Card Stock. Then I used an Aqua Painter to color them in a bit, also with Island Indigo Ink. 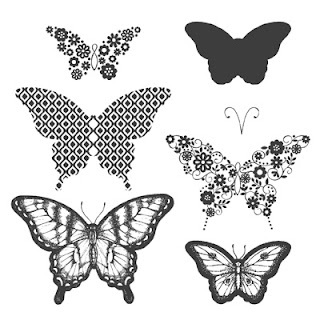 They were punched using the Elegant Butterfly and Bitty Butterfly Punches. The antennae were stamped on a scrap of paper, cut out by hand and adhered to the backs. Stunning card, Sandy, Love those flowers!!! Perfection!!! Sandy the flowers and butterflies are stunning. Thank you so much for sharing with us this week at the colourQ! So pretty! I love anything with flowers and butterflies! Thanks for joining us at colourQ! An absolutely beautiful card. Love everything about it Sandy! Those flowers are gorgeous!! Great use of the colors. Thanks for playing at ColourQ! Happy New Year! 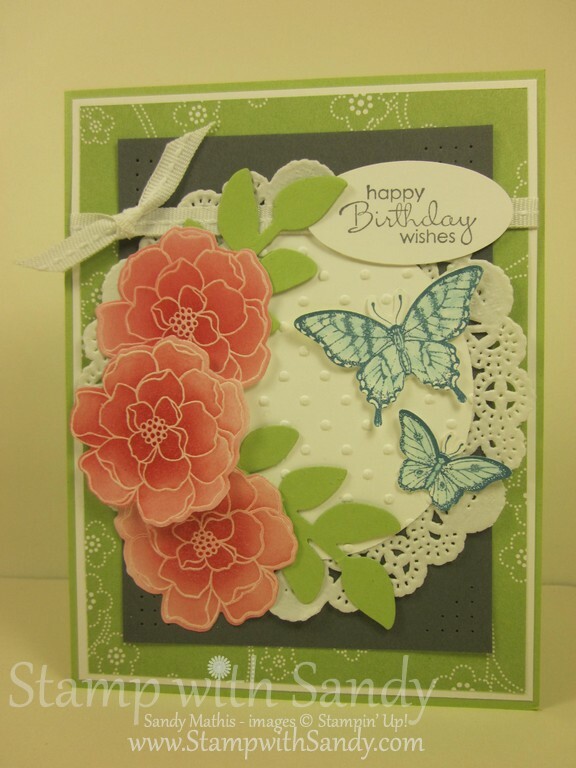 Gorgeous card, Sandy, I love all of your stamping! Thanks for joining in the fun at the colourQ this week, Happy new Year!